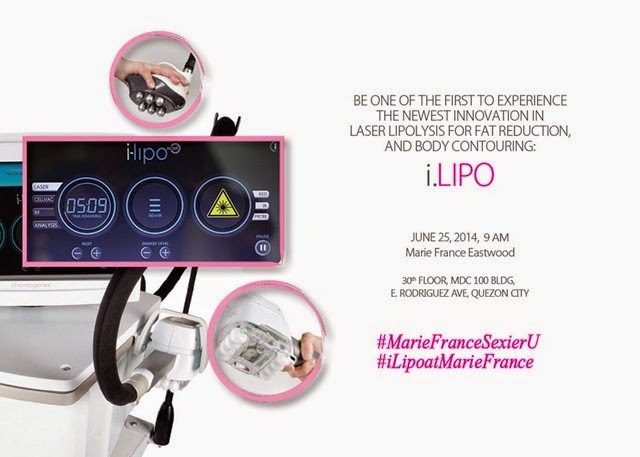 Marie France introduced i.Lipo Body-Shaping Laser, it is Hollywood's newfound slimming secret. I am happy to announce that it is now in the Philippines, what's more, one of you can get a chance to try it at a Marie France center near you. 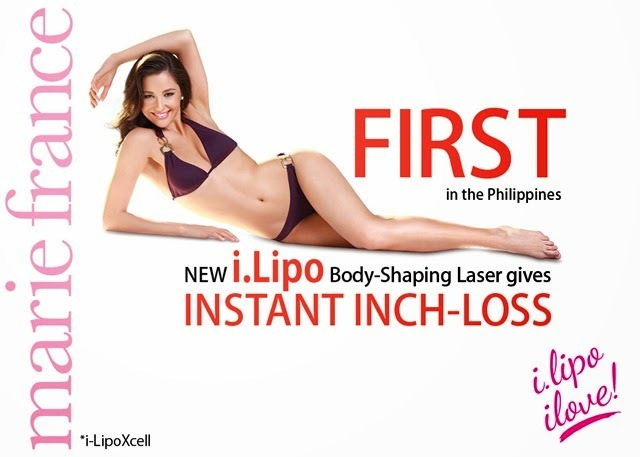 i.Lipo is the latest breakthrough in laser lipolysis, offering fat elimination and body contouring via low-level laser energy. It is a US FDA-approved treatment that targets and breaks down fat cells in specific areas like the tummy, arms, and thighs. With i.Lipo, inch-loss and body shaping are achieved safely and painlessly. ... so feminine (think pink!) 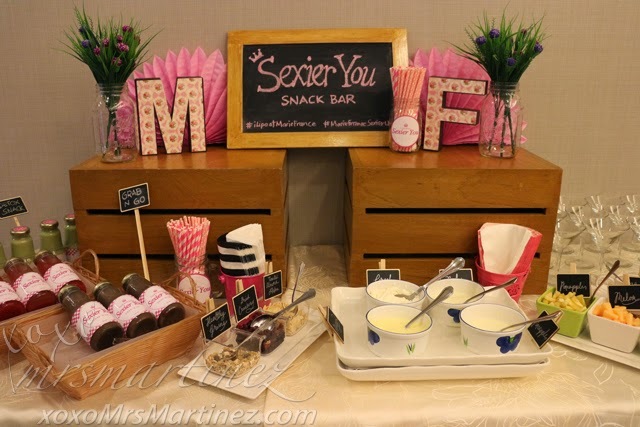 and so healthy yogurt-filled snack bar especially prepared for those who will try out i.Lipo that day. i.Lipo stimulates the body's natural response to fat-burning by utilizing low levels of visible red laser light to target and eliminate unwanted fat. With treatment pads placed on the problem area, i.Lipo emits laser energy to prompt fat cells to break down the stored triglycerides into fatty acids and glycerol. These are then transported to tissues for use when the body needs its energy reserves, thereby promoting metabolism. Once metabolized, these are eliminates through the body's natural process. So did i.Lipo worked for me? My answer is yes! In less than an hour (one single session), I lost a total of 6 cm in tummy area. And the best thing is I didn't feel any pain at all, just a slight warm sensation from the treatment pads but that's bearable. It is a very safe procedure and the treatment can be done once a week. It does not affect nor damage surrounding skin, blood vessels and peripheral nerves. More over, it can be performed on all skin types. Right after the treatment, media guests were able to meet DJ Delmar of RX 93.1. She was the first to try and benefit from i.Lipo. 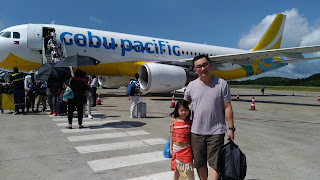 With her newfound confidence, she has this to say, " I had i.Lipo done on my tummy and thighs and now the pants that I had before my pregnancies are so loose. Which means I'm even slimmer now than my pre-pregnancy body! I just love it. The numbers will tell you that it really works". Marie France's drink are the following: *Liquid Vit, *Detox Snack and Grab 'N Go which is my favorite! It has almonds, filtered water, sea salt, cacao, dates, cinnamon and nutmeg as its list of ingredients. It tastes so chocolaty... I like! Call Marie France at 8942639 for a free consultation or visit its website. Congratulations Tara Cagadoc. Kindly email the following details: name, email, contact number and addres.